Style: Bungalow "Mobile (owned lot)"
Garage: "Garage: No Garage, Parking Pad; Parking Space(s): 2"
Lot Size: 15600 sq. ft. 130ft x 120ft "Corner, Rectangular"
QUIET LOCATION - IMMACULATE CONDITION - AVAILABLE IMMEDIATELY: This 2012 Modular Home has been kept in immaculate condition and is a must see! Very well maintained, very clean and tidy throughout making this modular home second to none! With 1520 sq ft, the floor plan is both very spacious and well planned. With the master bedroom in the back, it features both privacy from the main area as well as your own master ensuite with corner, rounded soaker tub with shower, spacious vanity as well as a full sized linen closet. The walk-in closet is always to be admired, giving that extra room where you need it most. Master bedroom is just a step away from the laundry/utility room. The back entrance door leads to an outdoor 16x16 deck and is just a few steps away from the main kitchen area where barbecuing your favourite summer meals is just way too handy! The kitchen is amazing! It is set up so conveniently that you will find that every bit of drawer and cabinet space flows into the next, making it easy to prepare and set out your meals whether it be a smorg or sit-down dinner. Plenty of dining space, coupled with a centre island, adding more than it being convenient, it adds great conversation with your family and friends. A corner pantry provides plenty of storage space; range hood microwave, fridge, stove, BI dishwasher are included. Light oak-coloured cabinets and tiled backsplash compliments the kitchen. This home provides the comfort for that turn-key, move-in ready opportunity! Sit back and relax in the spacious livingroom area where the open concept plan allows you to be part of the conversation no matter where you are! The 2 extra bedrooms are located in the front of the home with the convenience of their own 4 pc bath. This property really has it all! You will also appreciate the central air conditioning, landscaped yard, added storage shed and deck package. Make the call. 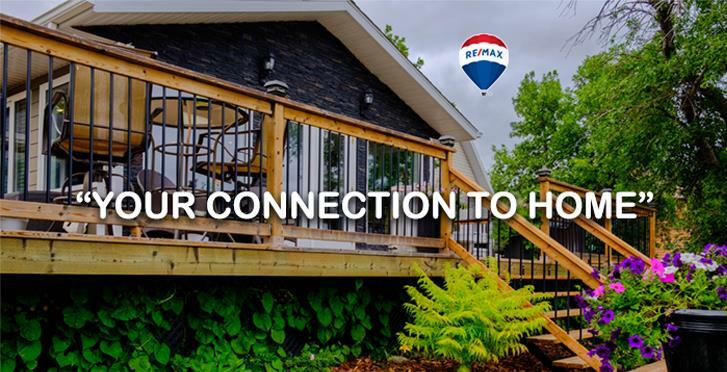 Call "YOUR CONNECTION TO HOME" to get all the information you need to make your next move.